After much deliberation and having read the comments on Facebook, I have realised that my list of “Best of KLIAVS 2018” more or less is the same as the lists that some audiophiles have posted on Facebook. A special mention must be made about people queuing up to hear a demo. This took place outside the Movee Space room and this is something that was not seen at the KLIAV shows in recent years. I can only recall queuing up to hear the demo of the Audionote Ongaku integrated amplifier hosted by Audionote founder Hiroyasu Kondo himself and also to hear the Sennheiser Orpheus headphones (the original model that was launched back in 1991). All these took place many moons ago, so to see people actually queuing up for a demo at the recent AV show took me by surprise. Here is my list of “Best of KLIAVS 2018”. Once again this is in RANDOM order. New kid on the block YL Audio tempted everyone by proclaiming that the demo system would cost RM2 million. Owner James Chin took a big gamble because had the sound quality failed to match the hype, he would have fallen flat on his face. 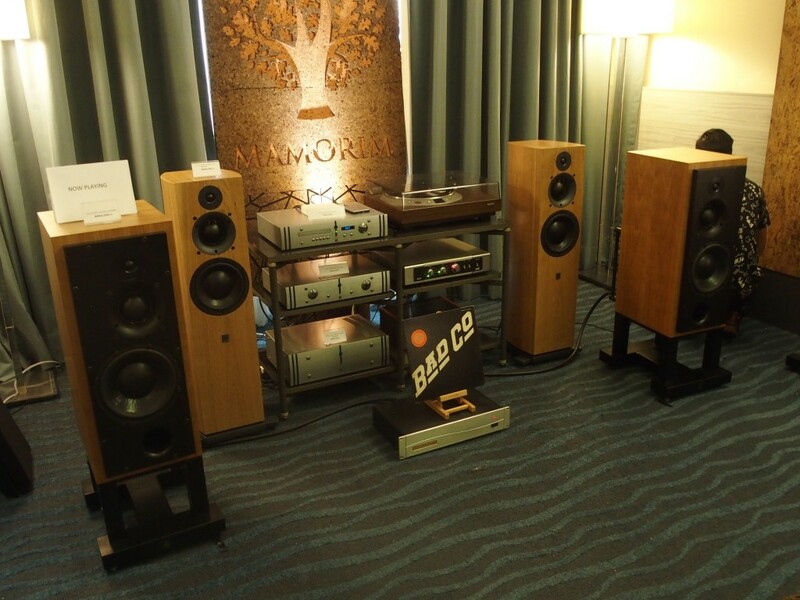 Luckily, James managed to perfectly tune his system comprising the Kronos Total Analogue Solution, the Absolare pre and power monoblock amplifiers, Sonus Faber Lilium speakers, and Skogrand and Echole cables. 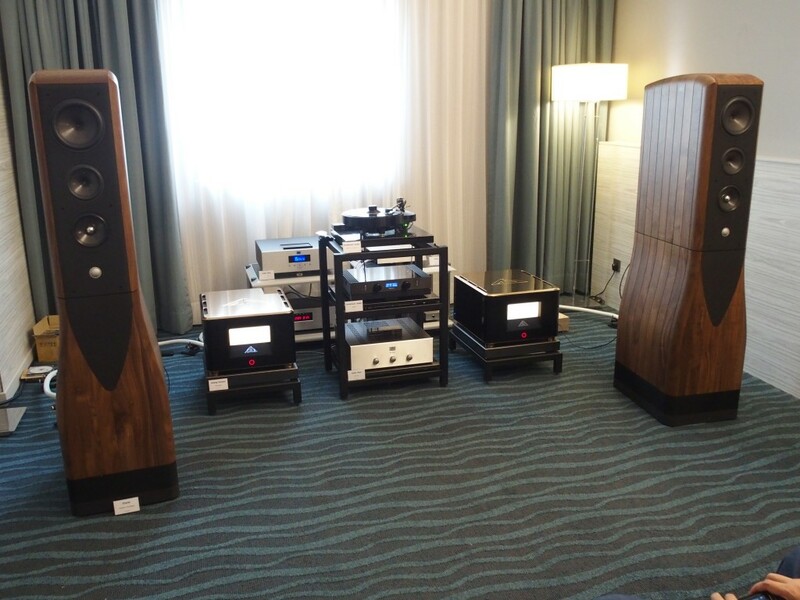 Most of the top audiophiles in town went to his room and emerged suitably satisfied and impressed. Many people on Facebook commented that his system had the “Best sound of the show”. Andy Tan must be very happy this year as many people commented that his room with the system comprising Audio Research Reference 160M monoblocks, Audio Research Reference CD9, Audio Research Reference 6 preamp, Audio Research Reference 3 phono preamp, Sonus Faber Aida II and Kronos Pro turntable with Ortofon cartridge, cabling featuring Nordost Odin 2 and Valhalla 2 interconnects, speaker cables and power cord, with tweaks like Quantum QRT QX4 and QB8, sounded good. 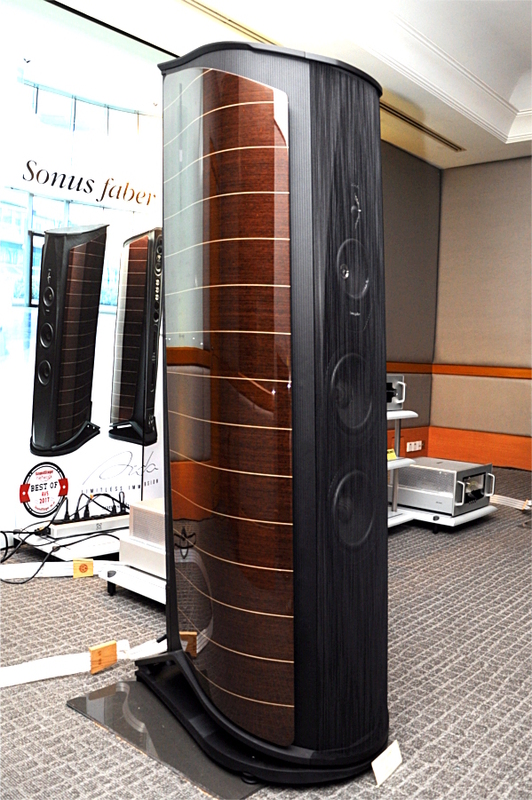 It was a big room and the tall top-range Sonus Faber speakers could fill it with good sound. In this room, there were great moments of jazz music. I went into this room many times and once when there were not so many people around, I was told to sit in the middle chair in the second row as that was the sweetest spot. True enough it was indeed the sweetest spot and I heard the sweetest sound from the huge and expensive system comprising the TriangleART Master Reference turntable, the TriangleART Osiris tonearm, the TriangleART Apollo MC cartridge, the TriangleART Reference tube amplifier and a pair of huge Venture Xtreme speakers. 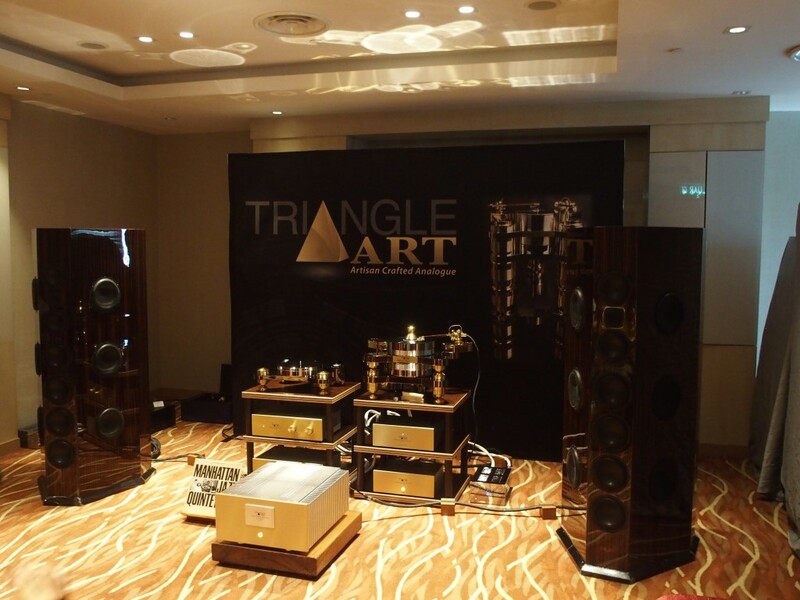 Many audiophiles commented that the TriangleART room sounded better this compared with last year. Well, it must be double happiness for Andy Tan. His other room which was used to launch the flagship Cambridge Audio Edge series comprising the Edge A integrated amp, the Edge NQ preamp with network player and Edge W power amplifier driving the KEF Reference 3 speakers also sounded quite good. In fact, I have never heard Cambridge Audio components sound so good. But these are the best that they can design and make. They are a bit pricey, but you get the best of British audio. 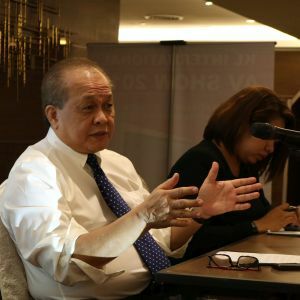 When I stepped into this room, I was confused for a moment as I saw the big Chario Academy Serendipity speakers and thought I was in the Swedish Statement room (Chario is distributed in Malaysia by Swedish Statement). Then a Dong Fong executive told me that the speakers were a traded-in pair which they decided to use for the demo. Spinning the vinyl was a Brinkmann Bardo turntable with a 12-inch tonearm. Preamp was an Audionote M3 while the monoblock amps were the massive Analog Domain The Athene which pumps out 2,000 watts into 8 Ohms. With that kind of muscle driving the Charios, the music just flowed effortlessly. Kenny Sin was having great fun. He was playing Bad Company at very high volume and his room was rockin’ and rollin’. 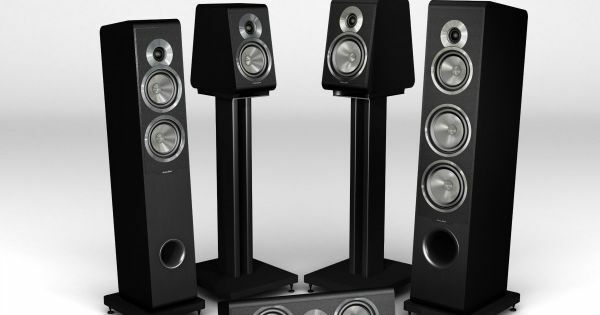 The ATC SCM50 Classic Active speakers were not even breaking a sweat. But at the volume that Kenny Sin was playing his rock – and even disco – songs, the music from his room could be heard from Maxx AV’s room a few doors away. But what the heck, it was a great treat to hear Bad Company songs and the ATCs were in their element and sang loudly. When I left the room, Kenny was grinning. 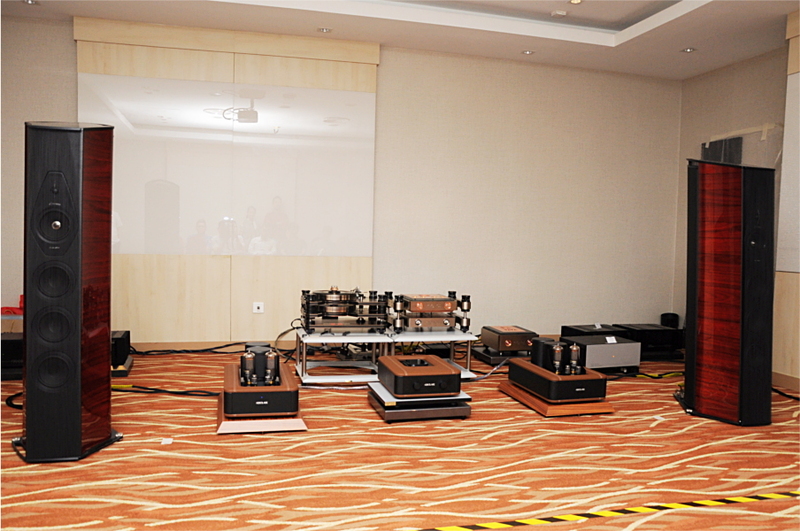 Jo Ki was hosting the demo in this room and he played digital files on the Bryston system with PMC speakers. Once a while, he spun some vinyl on the Bryston turntable. As usual, the sound quality was good and the selection of demo tracks was excellent. AV Designs has always been included in the “Best of…” list every year. Kenny had set up two systems in his room. One was based on the McIntosh MA252 integrated hybrid amplifier while the other was based on the McIntosh MA8900 integrated amplifier (with McIntosh’s famed autoformers). 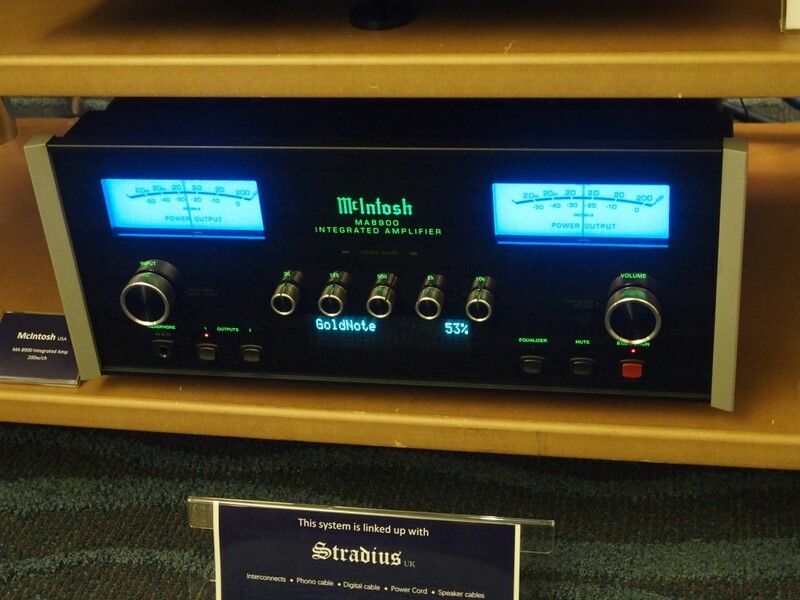 The latter drove a pair of Opera Quinta floorstanders while the former drove a pair of McIntosh standmount speakers. Turntable used was the Gold Note. I much preferred the MA8900 driving the Opera speakers, The MA8900 had a nice warmish sound which was also quite powerful and ‘solid’. This was a most controversial demo system. Some audiophiles hated it while others praised it. I heard this twice and I think it was dependent on the demo tracks. Playing the right songs, this system could sing very well. With songs that did not reveal the special traits of this system, it sounded very, very ordinary. Also the listening room was oddly shaped and this could have affected the listening experience. 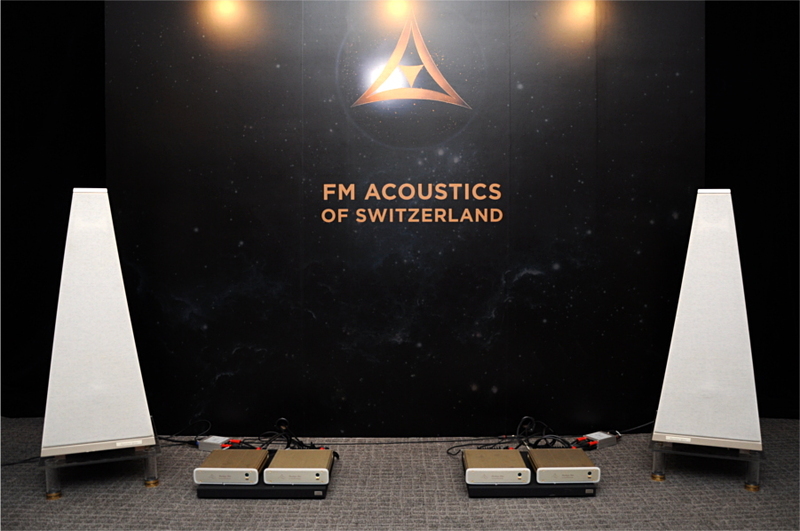 Whatever….I think this year’s FM Acoustics system sounded better than last year’s. The AV demo in Movee Space’s room. This is another new kid on the block. 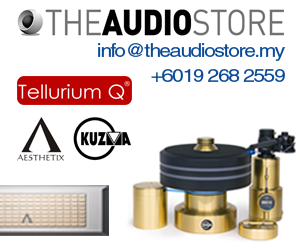 Movee Space is the Peninsular Malaysia dealer for the products brought into Malaysia by Sound Fusion which is based in Kuching, Sarawak. People waited for up to 15-20 minutes just to get into the demo room. 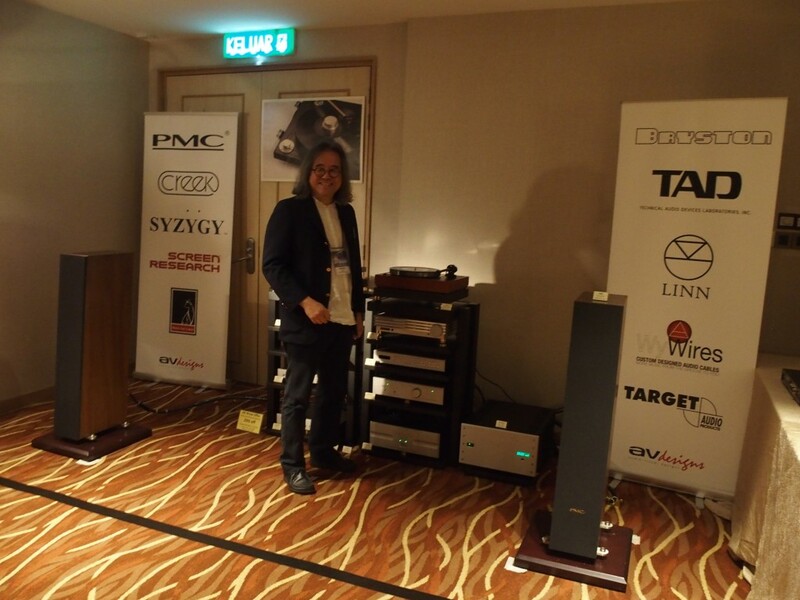 I was lucky as I was introduced to owner of Sound Fusion Tan Chung Wei on Thursday, a day before the AV show started. 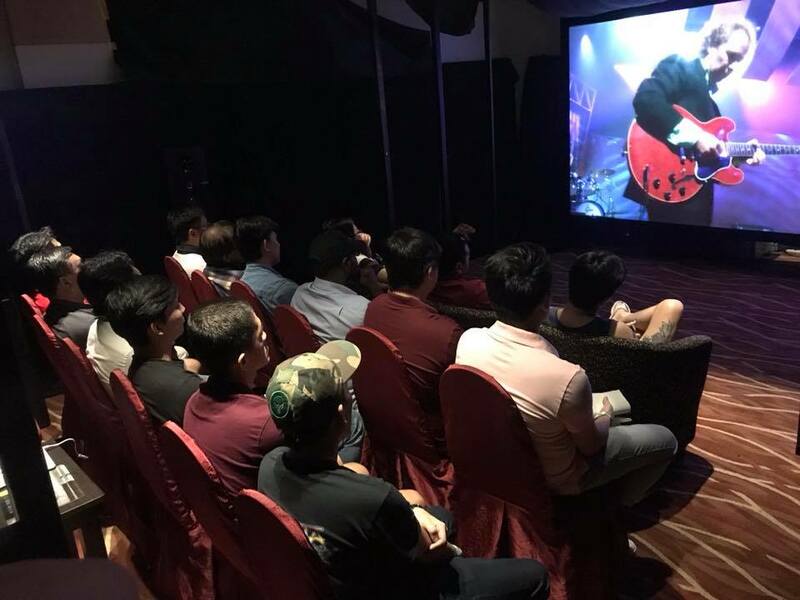 Despite the fact that he was still tweaking the demo room system, Tan treated me to a short demo of the sound and vision of his system comprising StormAudio AV processors and StarkeSound speakers/sub-woofers in a 7.4.4 system. The next day, I wanted to go in again and was told to return in 15 minutes. On Saturday morning, I slipped in when the crowd was thin and managed to experience another demo. Suffice it to say that the established AV specialists in Peninsular Malaysia will be facing stiff competition from Movee Space. During the moments when the listening experience was not disrupted by loud rock music coming from Hi-Way Laser’s room, I could discern that Max had tuned his AV system to have a very tight and fast bass. It was as tight and fast as the bass I heard in Movee Space’s room. He was using an Emotiva/SVS system with the JVC DLA-X5900 4K projector. The picture quality was sharp with dense colours. As usual James Tan weaved his magic and came up with an AV system that had excellent picture and sound quality. His system comprised the Bryston SP-4 processor, JVC DLA-X5900 4K projector, Bryston amplifiers, Bryston speakers and Syzygy sub-woofers. Just opposite the AV Designs room was the Epson room which featured Epson projectors that had been calibrated by AV sifu James Tan. There were the Epson EH-TW8300 and the Epson EH-TW5650 projectors on demo. By the way, the EH-TW5650 was the best bargain at the AV show as they were priced at only RM3,200! 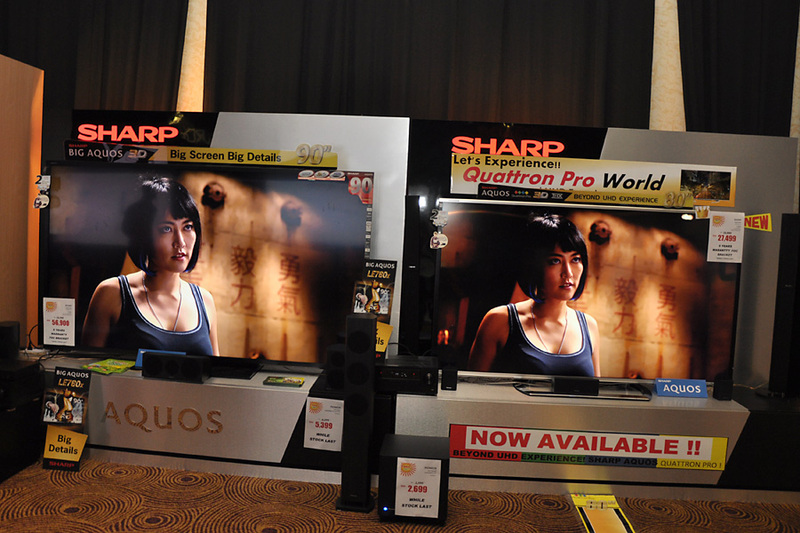 The EH-TW8300 is only a Full HD projector but James Tan had somehow turned it into almost 4K quality.